Beautifull louis, Love the different Textures, Hard,landscaping and Planting... Beautifull..
Great planting in a beautiful setting, have used your previous pic as my desktop background for this week. Lovely Louise, is that the front or back, love the tree by the gate what is it ? Always enjoy seeing photos of your garden. 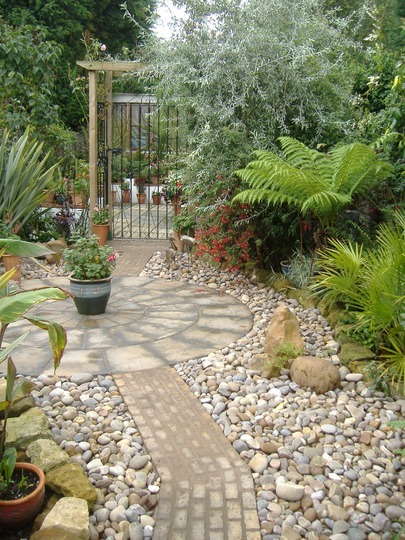 Really like that Louis - the path, pebbles and circle and of course, the ferns. Just love it ! Lovely area! I just want to hide in there with a book! Thank you very much ladies.....The tree by the gate is a contorted pear tree, and it's my back garden, leading to the courtyard. Very easy border to maintain, as they look after themselves, apart from pruning the contorted pear tree once a year.....and yes Madperth dissapear, with a book and a glass or two of the red stuff LOL. I'm all for that Ree!! Yep! How many seats are there, Louis? Hasnt anyone told you its winter? Are you going to magic us up some sunshine, Louis? I like to sit in the sun, thanks! Or the greenhouse if the red stuff's there! Lol! Hahahaa The greenhouse is a no go area, as it's full..........sorry, but I tell you what I'll do...... I'll open a bottle of the red stuff, and have a toast on you girls...........CHEERS !!!! How about that. Is everyone happy now hehe !!! I'm sorry Amblealice...we'll have to go to plan B....and please don't ask me what plan is that, coz I do not know myself...LOL!!! Thank you DD2.......I will have a look at your blog and see, what can be done....as for me fee...for a GOY, it has to be "cheap as chips", how about that haha....!!! Ten penny worth do you? I will, I will, Annella....They're organizing my life now LOL !!! Hahahaaa, all my advices are for free, to my GOY friends, so don't panic Annella LOL !! I like to see the Fatsia, so I planted one in front of my french doors. Now every time I'm in the kitchen, it's there in my view, and the bigger it gets, the better the view. So if I was you, I would plant it in front of your conservatory. I like them so much, that I have 4 or 5 of them lol. I'm planning a gravel garden for next year Louis so looking through GOYpedia. This is wonderful....really lovely! Is it really in Northants Louis? It really looks tropical and lush, not just in your garden but across the drive as well! I could be coming there for my hols next year!! Thank you Karensusan6 and Skipscanda1. absolute class your garden i love it ideal place to hide with a beer in hand. Thank you Mrrottie, and don't forget a glass of red wine LOL>>>!! !